What I’ve been fretting about – declining auto sales despite the biggest incentives ever to overleveraged car buyers as the bottom is falling out of subprime auto loans and used car values – is now a reality. Total new vehicle sales in March fell 1.6% year-over-year to 1.556 million cars and light trucks, according to Autodata, and are now down 1.5% year-to-date, with truck sales rising 5.2% and car sales plunging 10.6%. 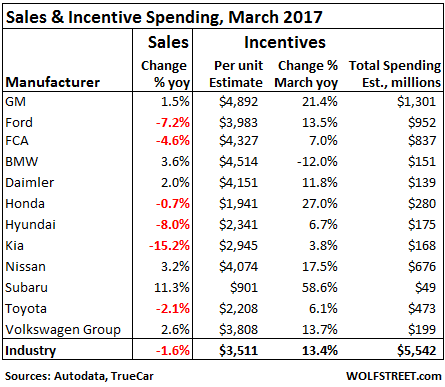 This wouldn’t be so bad – just an “unexpected” sales decline – if automakers had not shelled out $3,768 in incentives per new vehicle sold, the highest ever for any March, according to J.D. Power. This would be about 10.4% of suggested retail price. The prior record for March occurred in 2009 as the industry was collapsing. These are unit sales by franchised dealers to their customers, and by manufacturers to large fleets and to their own employees under their employee programs. Inventories are bloated, and the number of days a vehicle sits on a dealer lot before being sold rose to 70 days on average in March, according to J.D. Power – the longest since July 2009. Here’s the thing: As incentive spending in March surged 13.4% year-over-year, according to TrueCar estimates, total vehicle sales fell 1.5%! “We think the industry is plateauing at some levels,” Ford Chief Economist Emily Kolinski Morris mused on a conference call. To accomplish the feat of a 1.5% sales decline in March, auto makers spent a total of $5.54 billion in incentives, according to TrueCar estimates. GM which spent the mostest the fastest (nearly $5,000 per vehicle sold) saw sales inch up 1.5%. But Ford, which has been priding itself in its “disciplined approach” to incentives and spent just under $4,000 per vehicle, got crushed, with sales down 7.2%. At this rate, GM would spend nearly $4 billion a quarter. Alas, in Q1 2015, GM reported global net income of only $2 billion. This math isn’t going to work out over the longer term. “You have to ask yourself ‘how far do you want to go? '” Nissan’s head of U.S. sales, Judy Wheeler, said about those incentives. There is a darker side to this: Consumers have become recalcitrant and have blatantly refused to respond adequately to record profit-eating incentives. Last time that happened, the bottom fell out of the industry. And what would happen if automakers somehow managed to curtail incentives? If they could somehow inch back from the precipice, in unison? Consumers would just say no. They’d go on strike. Why pay $8,000 more for a vehicle than it would have cost a month earlier. Better wait for a new deal. It would crush sales. That’s what would happen. That’s why it is so hard for automakers to get off incentives once they’re trying to use them just to maintain sales. They’re an addictive and, once taken in enough quantity, destructive drug. And because we’re talking about a crazy month in the car business, a word about Tesla. It sold 4,050 new vehicles in the US in March, according to Autodata. All automakers together sold 1.56 million new vehicles in the US. Tesla isn’t even a rounding error in this number. It’s invisibly small. It has lost money every year of its 10 years of existence, including $1.86 billion over the past three years. It might never make any money. It might instead continue burning through investor money at an astounding clip. Yet its shares surged today, and its market capitalization hit $48.6 billion, and exceeded Ford’s market cap. That’s how crazy things have gotten. We have a Subaru and a Volvo. Very fine, should last us until into the 2020’s, at which point self-driving tech + electric may become practical for us. We can easily afford to buy anything we want, new cars every year if we felt like it. Car sales are not that bad. According to data published, 2017 year-to-date sales is down only 1.6%. Yes, it is minor slowdown but not devastating. Yes, as I said in the article. But you miss the point. What is “devastating,” to use your term, is that this 1.6% decline happened despite all-time record high incentives by automakers, which totaled $5.5 billion just in March. That would be over $16 billion in incentives a quarter, coming straight off the pre-tax bottom line. They threw THAT much money at the market, and sales declined 1.6%…. That’s the killer. Seems to me that the credit cycle is now aligned politically with whatever administration is in office. Obama pushed the cash for clunkers and that was supposed to stimulate, then they lowered standards for people who otherwise wouldn’t qualify because they felt confident because their man was in office. Now the administration has changed and the people who felt confident before no longer do but they were the primary demographic they were shoving cheap credit towards. Thanks fed for effectively politicizing and financializing our economy. Bah….the only reason new sales are down is that Tesla’s new model ‘pre-sales’ is eating into the total…..but can’t be reported since no deliveries can be made….yet! But stay tuned…massive production growth (from 0) is just around the corner! Tesla overtakes GM as America’s most “valuable” (in a Fed-blown Ponzi market) car company. Makes perfect sense…as long as you ignore the fundamentals. I just converred my shorts on telsla. I have no doubt that car industry is a liusy business no matter how you lip stick it. i have full respect to car industry though. It is the true power horse of the modern society and backbone of so many other industries. Elon Mask is invatiging how to download human brain now. Kudos to him. when it all goes well, he makes money. When it fails, it is other people’s money. I have always asked myself why would anybody want to give him money to take on all of these money losing risks. Right, it is government subsidy and zero rate in the bond market. It is the poster of unsound money creating unsound businesses and look like a hero. – Selling cheap and still overpriced (compared to other sites) junk on Amazon will make you a market leader, and make you a ton of money. – Selling overpriced iCrap to lobotomized teenagers living in their parents basement will make you a market leader, and make you a ton of money. – Selling cars for 80,000 (with government subsidies) to faux greens, with years of warranty will make you a market leader, and make you a ton of money. Buffet says, it is only when the tide is out can one tell who did not wear shorts. Elon will be fine, those who lost money will be fine because there will be another tide of bailouts. But you will see them naked for a while. I see Elon musk as a great contemporary con man; I can imagine his name eventually be included in Wikipedia with the likes of Charles Ponzi. All that money, and he can’t even keep himself fit; do you really expect a guy like this to take us to Mars? But he is able to charm many, and I suspect a large percentage of Tesla investors are Asians; I could be wrong, but I think somehow Asians love him. I could be wrong, but that’s my observation. By the way, don’t mention anything negative about Tesla or Musk on Yahoo, or else your account will be deactivated :). Make it to mars? Man has to make it to the moon first! I wonder when his next rocket explodes. I bet it happens before this fall. Errr, what does this have to do with the article? Rates are still extraordinarily low (the 2-year treasury is at roughly the same level today it was when cash for clunkers are enacted by Congress), and incentives are at record highs. I, for one, shall not miss the car industry. I’m fed up subsidising car production, decaying roads, insurance companies, hospital accidents, and all the resulting climate change with my taxes. It’s about time we learned to walk and bicycle and use public transportation, and maybe we might actually begin talking to each other again. Let the industry die, and let’s admit it was a historical mistake. Just a temporary setback–the Fed will hop on their unicorns and slide infinite dollars down the skittles rainbow and car sales will shoot to the moon. Lol. Actually, I’m waiting for my incentive check to arrive in the mail from Janet, as we speak. WHAT??!! She only writes checks to commercial bankers like Jamie Demon? No wonder the stock market is about to crash! What moron would believe a banker could help the economy! Bankers only give-a-turd about themselves?! Anybody wanna bet we will see Demon sitting in front of Congress very, very soon? At least more trucks (+5.2%) are being sold than last year. Would be interested to know total industry revenue $$ amount last month versus last year. Any way we slice it, i think auto profits will not grow this year. Add that to a decline in shopping mall profits and (quite possibly) a decline in restaurant profits. So it’s up to the tech sector, consumer discretionary and banking to keep the bowling pins in the air. Profits not growing is an extremely optimistic scenario for this year. The car makers were quite profitable last year. GM racked in $11 billion. But again fleet change is nearing its end, not clear how sales can be sustained going forward. And some 60% of new cars are on credit anyway. Throw in demographic changes as well. Younger generations less likely to own a car, more likely to live in the city and use public transportation or car services. Also Wolf has pointed out in other articles that used cars are going for cheap, cheap, cheap. If you’re a value-oriented consumer, why buy new when you can buy a car that was leased for 2 years for a fraction of the price? Great comment! I wish people would wake up before it’s too late. But………they won’t. We’ve seen this movie before. I think a data point is missing with the GM income figures. In 2015, when their net income was $2 billion, what was the amount they spent on incentives? To make the comparison to the 2017 figures when they might spend $4 billion in Q1, is missing this important number to make the comparison valid. It doesn’t tell us whether GM will make a profit in Q1 this year, either. It seems you stuck this to the wrong one of my comments. Can you copy and paste it under the right one further down? Thanks. Sorry Wolf. Donn. If you could or wish to delete this one, I would really appreciate it. How does the electrical vehicle market affect these figures? I doubt it’s significant. Weird, with all the incentives and tax returns, one would think q1 would be a good quarter. Every automaker’s EVs are included in this list. Tesla, Ferrari, and others didn’t make the list because they’re too small but their numbers are included in total monthly auto sales. I’m pretty sure that your refusal to be a debt serf makes you an Enemy of the State. Actually being one myself with friends and family in the ‘ State ‘ inclduing the NSA I can guarantee you we are considered at the very least a ‘ threat ‘ to the ‘ State ‘ .. in part because we’re not ‘ contributing ‘ to the overall Debt/Profit ratio … and in part because in their minds we’re beyond their ability to control us . Ironic … aint it ? Doing the right thing .. only to be considered .. bad . I don’t believe in paying interest to banks. I own my home, cars and a small travel trailer. Everyone has to take responsibility for their financial situation since our country is being run by ignorant bafoons. Save what you may and keep the bankers at bay. There is a darker side to this: Consumers have become recalcitrant and have blatantly refused to respond adequately to record profit-eating incentives. It’s probably more accurate to say tapped-out consumers facing the eroding of their purchasing power (due to the Fed’s debasement of the currency) and economic insecurity (thank you, globalist CEOs) are curtailing major purchases and/or finally balking at going deeper into debt for depreciating assets. As the 99% continue to lose ground in our neo-feudal oligarchy, these figures will only get worse. I’m 65 and bought myself a new car three years ago this month. The odometer just passed 10,000 miles. A few years ago before I retired I drove that per year. The automakers must have data on miles driven by age of owner and, as the US ( and European population) is growing older, get a pretty good idea of what the natural demand for new vehicles will be. Wolf, thank you for the words about Tesla. At market close Monday 3 April, its stock closed at $298.52 and its market cap was $48.63 billion! As I write this, its Pre-Market number is $297.05. As the new Delorean, maybe there will be a movie someday about coming back to the present in a time traveling Tesla. I’m sure future populations will want to know how people could be so stupid as to invest in a company that has never earned a profit, and never will. I was parking at a trail head for a long hike in the forest of the Olympic Peninsula, when I spotted a beautiful, four door sedan parked there. I don’t normally care about new cars but this one was really special. It was a Tesla. First one I ever saw. Now I know why people – who can afford o email – love them. They are different and beautiful. The one thing many people do not bring up is gasoline tax pays for road construction. Essentially drivers of electric vehicles are not paying for the roads. LOL I am guessing they will have to start adding a tax to the number of miles driven in an electric vehicle? True. But the costs of road repair are directly related to the weight of the vehicle. Electric cars tend to be much lighter than ICE cars. But the gas tax is an excellent source for road funds. Heavier vehicles do more damage, but require more gas, so they pay for the damage they do. Minnesota may add a $75 to $85 dollar fee for license tab renewal on electric cars. The House Republican, Pat Garofalo, who proposed the idea drives a Tesla, eh? A Model S weights 4400 – 4900lbs. Those batteries are heavy. Hasnt Amazon paved the way on this concept? Seems Ive read numerous articles predicting its ultimate demise! Pure speculative insanity. Heckova job, Ben & Janet. I saw my first Tesla the other day. It was parked and I wondered what in the hell kind of car it was. Not because it was ‘impressive’ but because the marque was unknown. No way would I pay $80,000 or whatever these things cost. So its electric and quiet. BFD. Isn’t the whole point of a sleek, high performance automobile to announce its presence by the growl or distinctive whine of its motor? Maybe it’s a cultural thing. Times change. In many markets the idea of an obnoxiously loud engine as a macho, cool thing has become… what’s the word, passé? Yahoo Finance and MarketWatch disagree with each other this. Hmmm, who should I go with? And yet .. didn’t the ‘ so called ‘ president with yet another stroke of his ADD pen just eliminate all subsidies , carbon and tax credits for EV’s etc – et al – ad nauseam .. for which without the EV industry cannot exist ? So where’s the logic ? Sales are in the tank … the company’s been in the ‘ Red ‘ since day one despite multiple government subsidies , guaranteed loans , carbon tax credits etc … the government subsidies ‘ rug ‘ has just been pulled out from under them … yet the stocks continue to rise . Hmm … so why is it I get the very distinct feeling there’s a bit of behind the scenes manipulation/shell games going on with TESLA ? Hmmm ……. PS; – Unitron .. re; ” the new DeLorean ” … extremely apposite in more ways than one and my sentiments exactly … been calling them that since day one . Electric cars are the future. If we don’t switch to electric soon we won’t have a livable planet to call home. Sorry about the reality thing. It’s not about what we want to drive, it’s about our survival as a species on our wonderful blue planet. We have no more time left and we are not in control. Physics is in control and we seem to be living in our illusions of happy motoring. Climate Change is the most serious problem ever faced by humanity. Can agree with the climate change as a part problem, but if this super bubble bursts, the main problem will be not enough CO2 production. We need to do a lot more than switch to electric cars to keep this planet livable. We farm using tons of energy and chemicals which end up in either subterranean water or oceans and lakes or pollute the air. The pollution and over fishing is making it harder and harder to collect enough fish to keep that industry going.. The chemicals we use to farm are killing the bees and without bees 60% of what we eat will not be there. Fukushima is dumping tons of radiation into the oceans of the world every day. Much of the big farm product is low in nutrients, high in carbs and low in Omega 3, high in Omega 6 fatty acids.. (look up Omega 6, it tweeks the part of the brain that tells you that you’ve had enough). And its cheap.. just another cheap drug sold by the same mega industries that sell us tobacco and Vapes. Then their big pharma drugs to fix all the illness they helped induce. On top of all that, most countries in the world and most religions want people to continue to propagate (faster). There is no way to have exponential growth in a finite system and the earth is a finite system. Electric cars are a very small part of what needs to be done. The problem is that doing what needs to be done will cost money and change traditions and cultures. It needs industry and the media to talk reality and not their game or product to make more profit. And we have a denier as Supreme Leader.. And a Congress who isn’t much better. They think that what is needed are more profits and more growth.. which are exactly the opposite of what we need to keep the earth viable long term. So I have my doubts that anything will be done soon enough to make any appreciable difference. Go drive a gas guzzler and enjoy the last years before extinction begins. Inconceivable! Yellen’s flying monkeys and the talking heads on CNBC assure us that Everything is Awesome! Buy more stawks! Go deeper into debt with money you don’t have to buy stuff you don’t need! Speculate with reckless abandon in the Fed’s Ponzi markets and asset bubbles! Wolf are these “Sales” from dealer to consumer or manufacturer to dealerships? If it’s the latter then GM didn’t actually sell more cars it merely stuffed dealer lots with more unsold inventory and added more days to mean time on lot. They are NOT sales from manufacturer to dealer (which are reported in dollars as part of the quarterly earnings releases). Just one minor correction: Amazon has been profitable on an annual basis, though barely in relationship to its size. Over the past 11 years, it only lost money in 2 years (2012 and 2014). Another difference: Amazon is THE dominant force in online sales. Tesla is minuscule, surrounded by huge competitors. I agree; and on top of that many people can afford to buy a$50 item from Amazon every now and then; but buying a Tesla would cost you at least $60K. That’s the difference between Amazon and Tesla. Not that I’m making excuses for Amazon, but Tesla and Amazon are way different from each other. In a sane, free market based on fundamentals instead of central bank financial crack cocaine, insane valuations like this would be unthinkable. I am one of those terrible customers from an auto dealer’s point of view. I’m driving a Citroën that I did buy 15 years ago and it will serve me still for years to come. It might even be my last car with a combustion engine, something that the ’20s probably will show and I’m not contemplatinga a Tesla …. I can dream up a lot of smarter things to do with my money than buying/ leasing a new car every 2 or 3 years …..
Friends don’t let friends buy poorly-engineered, shoddily built (by leftist labor unions) French, British, or Italian-made cars. Apart from Bentley which are not shoddy, what british cars/Brands are still british owned??? I think Rolls Royce and Bentley are owned by Volkswagen. So not even Bentley is British-owned. But Volkswagen is a global company, and Brits would certainly own a sliver of it. Does that count? Rolls cars defiantly remember the Debacle over the Trade mark name. And I was wrong google tells me Bentley also. Bentley still made in England by the British team but technically there are no longer any English cars. Apart fro, Bentley the last good English car was in 65. The fact that Bentley is now owned by bug explains the uglyness in the new continentals and mulsannes. Morgan cars is likely the to be the only 100% British owned company. A Bentley continental is still securable and solid, although like a Morgan it is hard to park without it getting vandalised it can still do service as a car. Bang a Bentley and it will end up with a dent, bang a Morgan, and you will frequently end up with a pile of splintered wood, so I don’t know if a Morgan still qualifies as a modern car and have yet to look up its shareholding. Here’s another thought: Aston Martin is owned by a consortium of investors. I’m not sure if it includes British money though. Its like ” made in America” is the only time we use the word America instead of USA. FYI is was born in that city Old Chap. When England was still and English mans country. Which it Most defiantly isn’t now. Countries get a big disease with a little name too (5 letters begins with I). Me, I prefer the colonies now, cleaner quieter, and only undesirable population elements in the main centres, which are easy to avoid. Must do something about all those horrid Americans like theil, that keep turning up, buying up huge chunk’s of the place for stupid money. Then behaving like they own all of it. If we chat to some of the indigenous people, they might start eating them. Apart from the plethora of kit car manufacturers, I believe that Bristol Motors are, just about (German sounding KamKorp owners are British Indian), still a British car manufacturer. My uncle has a country place that no one knows about…… Citroen’s are regal reminders! The Keynesian fraudsters at the Fed are coming up with more “good ideas” to “stimulate the economy” (meaning, further enrich the already super-wealthy at everyone else’s expense). Be afraid, taxpayers, savers, pensioners, and future generations. Be very afraid. Until Yellen the Felon, Zimbabwe Ben Bernanke, and the rest of this cabal of grifters are standing in shackles and orange jumpsuits before an honest judge, we have no hope of restoring free markets or sound money. You seem to ignore the tax laws that allows a gambling trader to pay much less as a percentage of their income in taxes than those who actually work for a living. The closer a person is to the bottom of the income scale, the more they pay in overall taxes, as a percentage of their income. Not only is the monetary system unfair to the producer but so is the taxing systems. Government allowed the pension funds to get into this shape.. Again, it wasn’t totally Ben and Jan. Pension managers had to do what they had to do to try and make up for the obfuscation by the rule makers. And in doing so enriched the Banksters and the traders who sold them a fantasy they could paste up on their windows and still get paid. I’m shopping and the dealers are hanging on pretty tight. Lots are stuffed but credit is elastic. So getting wow pricing must be further down the road. This reminds me of commercial real estate where all the buildings are empty but all the landlords are somehow flush. Great system the Fed has for the rich. Not being a “how-much-a-month-Harvey” with cash in hand, I can afford to wait as my five-year-old Subaru has plenty of miles left. But as dealer lots overflow with unsold cars and subprime delinquencies result in downward price pressure at car auctions, can dealers really afford to keep holding out for their wish price? Not only are dealer lots stuffed in our nearby city, most of the dealers are totally and extravagently renovated; better than brand spanking new. They all look like Morman Temples, with big parking lots, and a dais for truck worship. Everything still too expensive, though. Like Jarhead and a few others, I’ll just stay debt free and drive my old pickup. Tomorrow, I buy insurance for 6 months for my Honda CBX 500. One sweet ride and I can get 5 bags of groceries in the soft saddle bags. I will now be able to make my weekly town run for 1/3 the cost, in half the time :-). I paid $6,000 cdn for it brand new as a reward for a life of hard work. Cash. When I thought about buying a bike my wife, seeing my purchase angst said, “Buy it. You never buy anything for yourself. Live a little”. (God bless this woman). That’s a fine woman you have their Paulo. I asked mine 20 years ago if she minded if I bought a bike. She said absolutely not! You’re a father now with responsibilities! Sheepishly, I told her the new bike was already in the garage. I dont buy individual stocks. Is more, much more, than a car company. You have batteries. Solar roof tiles, which could very well fir, the potential is huge. And the house power system that goes with the, tiles, batteries, and car. Which is the concept of charging the car at night with energy from the tiles stored in the batteries during the day . Logically he needs wind generators in the house system as well. No It has never made money as a car company, it will be along time before it ever brakes even, let alone pays back its investors cash it has burnt as a car company. No american company today is worth its market cap, many of them are not truly worth anywhere near their market cap’s. Tesla is not just a car company, I think you need o look at it in that light. IF I had a lot more money than I do. And wanted to take a little GAMBLE I might be tempted to buy a little Stock in it, just incase it fires, as if it does eventually fire, it could be quite lucrative. Tesla has no battery technology. None. It buys batteries from Panasonic and other suppliers. Ok so whats his battery factory about??? The technology and manufacturing processes come from partners, such as Panasonic. Tesla owns the building. Ok that makes my outlook on them a lot more negative I understood he had the, tiles, controllers, batteries, and cars. Anybody can do controllers, and he is just the first to do tiles (which incidentally somebody should have done quiet a while ago) tile manufacturers around he didn’t even want to talk about it. Read Thor’s Hammer reply to my comment. He has some good additional info. You might want to ask him some follow-up questions. I still think they would be better off with Nickel iron batteries for stationary power packs. N/I batteries have a lot of green and cost advantages over lithium and are cheaper to produce with amuch longer life expectancy. When Exide brought and shut down NI production so it could milk consumers with lead batteries. solar panels were a NASA thing. today they are the battery for off grid storage but of course are mostly made in china with all the QC issues that go with chinese manufacturing. 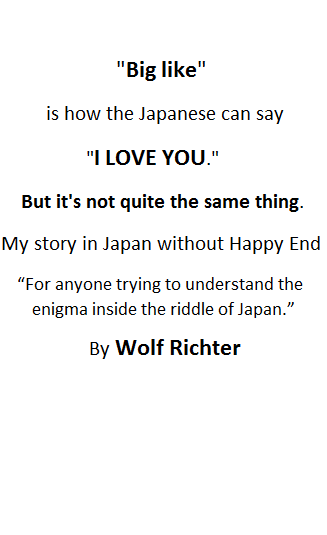 Wolf is 100% correct. But the battery factory is about manufacturing auto-sized li-ion systems at scale to dramatically reduce the costs. I’m not sure what the current Tesla battery configuration is, but the early 2 seat roadsters were powered by an array of several thousand small batteries that were basically laptop batteries. Tesla invested a huge amount of effort in designing electronic controllers and a liquid cooling system to prevent chain reaction runaways should an individual battery fail. So I’d say that the Roadster was indeed powered by a Tesla battery, and the individual (batteries) were more like sub-components. At about the same time I was asked to design the carbon fiber containment module for the Fisker sports car that was the potential competitor to Tesla. Advanced Lithium, the battery design company based in Vancouver BC reputedly had Paul Allen as one of its angel sponsors. I’m no electrical engineer, but even I could see that their design was fatally flawed. It is fashionable to denigrate Tesla as just the most successful feeder at the government trough, but doing so requires turning a blind eye to the incredible contributions the company has made in pioneering, developing, and marketing a revolutionary game changing product. One manufacturer boasted about its great pricing on year old cars. I bit and hit the send me a quote button. No quote will be sent. Instead it will be sales people ready to “value” my trade and find out how much I can spend per month and what my credit score is and how much I owe. Phishing for Phools indeed. Beware scam sites that promise to give you access to special deals on 2016 closeout models or similar “special pricing.” My wife foolishly signed up for one of those sites, and her e-mail inbox has since been inundated with all manner of spam while the phone is ringing off the hook with calls from dealers offering “great deals” that are in fact not discounted at all. My family runs five auto dealerships and I can tell you that they will sell you a new vehicle at a loss and promise free oil changes etc. Believe it or not 95% of people come to the dealer for service where they get fleeced for every little thing. A new car dealer in one of those small satellite buildings you see popping up everywhere can do $150K a week just in service alone. They make more money from you that way. By the way, they routinely sell $70K vehicles to people with $500 down at exorbitant interest rates for 84 months. When the guy defaults after several months they simply repossess the vehicle and sell it again. Half of Americans are living paycheck to paycheck, and everyone but the Fed’s favored bankers and hedgies are facing an uncertain economic future. This is not conducive to major purchases. Wolf, this story is gaining traction (in the alternative media, anyway). in sale tax. Insurance cost in a major city, another min. of $2,000-. it’s health. You save Dry Powder !!! thousands of dollars in cost. Can add risk. I don’t want Silicon Valley in my car. Period. technology. They have to do something when money is cheap. depreciating, asset. Zero value looks cleaner. These metrics probably don’t include leased vehicles. I know the incentives for leasing are through the roof, too. It has lots of very expensive electronic modules in it with # of cycle automatic failure keys built into them. That must be replaced with a replacement module and matching computer code. I used to swear by BM now I wont touch them. For that reason. Yes I know. I own a BMW/Merc repair and service shop with world pac/IMC accounts. Been working on cars for 20+ years and the diagnostic tools and reset computers are getting more and more expensive. It’s ridiculous. Most cars now days have similar electronic modules built in. I prefer the diesels. I like BMW, always have. My husband also drives a BMW. But we decided once we pay these off, we will keep them indefinitely. Considering what junk BMW’s and Mercedes really are, your biz ought to be booming right now. All modern cars are junk. BMW and Mercedes are simply among the best of the modern junk. There are only 2 good american cars made post 1971. Both oddly enough are Dodges. 1971 440 charger, and the V10 vipers. Yes, these numbers include leased vehicles. They’re included because the dealer sells a leased vehicle to the leasing company which then leases it to the customer, so it’s a “sale” for the dealer and thus included in these numbers. Diesels run forever. And instead of leaving a quarter under your pillow, the tooth fairy will leave a $1,000 invoice for your latest morning visit to the strictly German speaking dealer. Back in the 60’s I put 500,000 miles on two Mercedes cars, both purchased used for less than $2,000. Recently looked at a used Mercedes for sale built in 2003. Progress had arrived in the form of complete absence of a dip stick or any means of determining if the engine was low on oil except for an electronic sensor. Who needs to change the oil anyway, just replace the engine when it fails. Further research disclosed common failure of the Comfort Module which locks the seat in most forward position and prevents the doors from being opened from the outside. By the way, that control unit is mounted where a minor failure in the water drain system under the hood floods it and renders it inoperative. Enjoy your new technical marvel—. Is there a website that will give you the best price for any car and all you do is call the dealer and pick it up. What would be the money in that? There might be such a website, but no dealer in their right mind would participate in it. The “auto mall” around the corner from my store has started to stockpile Many cars up the hill at the event center. Trade numbers are down because only Americans buy american! I am shocked, shocked! that one of Yellen’s flying monkeys would leak insider information to his Wall Street confederates. Of course, he won’t face any criminal penalties in our crony capitalist wonderland. All animals are equal, but some animals are more equal than others. I wonder, was it a top secret information about the QE infinity plan? out of here”. Sound like a divorce procedures at the nadir of the $EURUSD. If the $EURUSD will rise for years, profit in strong euros would have flown back into the US, even in recession. Any Us corp. that have a European division can help boost profit. Take the case of PM & MO. The Siamese brothers. hit GM with a tsunami. GM future : a regional mfg. , smaller than ford, not so important. in 2008/09 , but that was able to escape the grip of a threatening bear. It popped up fast from $1.01 to above $18- and now they are gliding down, losing altitude. Price declines(incentives) are racking up big right now. So is dealer inventory lots. Remember…. Nothing accelerates the economy like falling prices to dramatically lower and more affordable levels. Nothing. Tesla is actually one of the most successful car companies in history, with booming sales no other manufacturer can match. They do this without any incentives. This makes sense, because incentives would produce higher sales of cars, an unprofitable line of business for them. Instead, they focus on selling slices of the company, through debt and equity offerings to gullible investors. Compliance credit sales are another reliable source of profitable revenue for Tesla. TenCent’s recent 1.5b investment in Tesla will finance botox-overdoser Elon Musk’s drug-induced hallucinations on Mars travel, Moon tourism, tunnel-boring, computer-human integration, and rocket supremacy for the next year. Great way of looking at Tesla. Remember when “Zimbabwe Ben” Bernanke assured us that “subprime was contained” shortly before the housing bubble imploded?